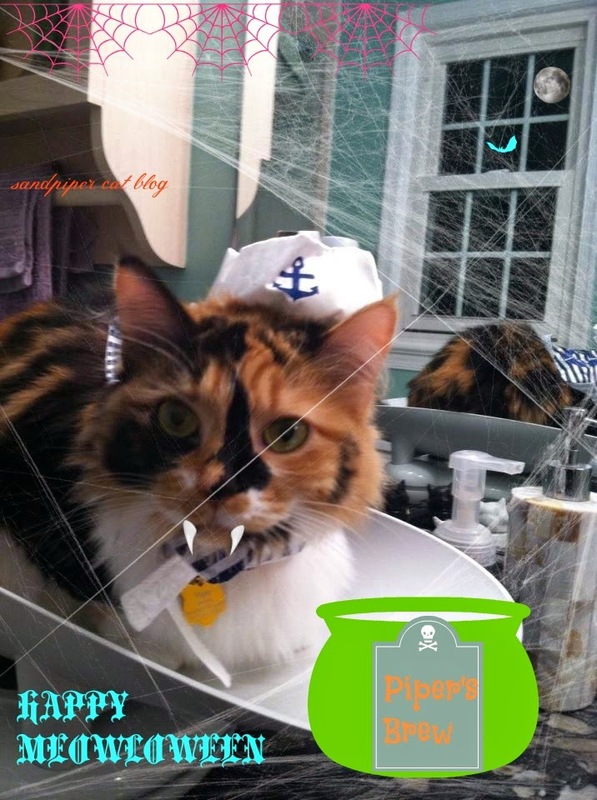 Piper says Happy Halloween witchees! With Halloween just hours away, it is important to remember you should put away your kitties when you are opening the front door for trick-or-treaters. That way, they can't scurry out the door while you are handing out candy to cute little ghosts, witches and the occasional cat. 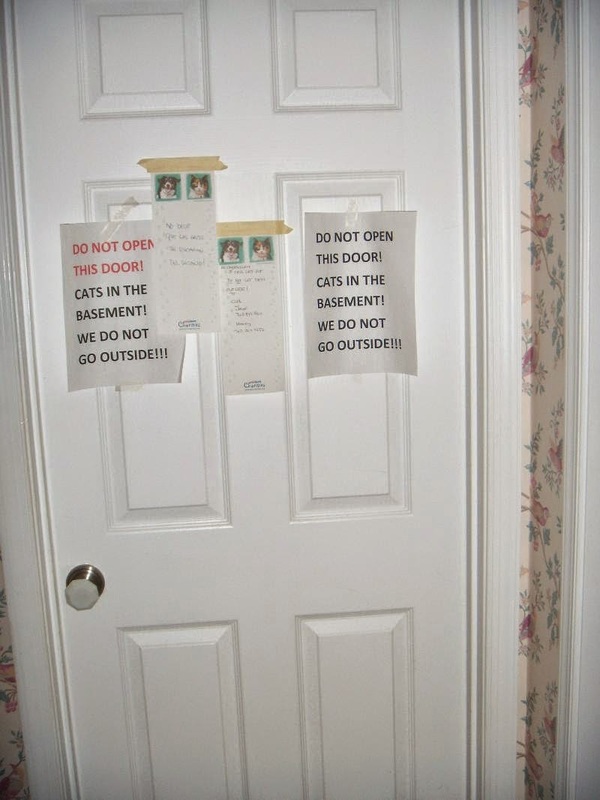 At Sandpiper Cat Blog, we take opening the front door very seriously. We rarely ever use the front door because we are worried about our cats getting outside, as they are strictly indoor cats. We even get into our house by going through the garage and laundry room. We call this the "air lock" because we wait for the garage door to be completely down before opening the door into the laundry room. Just like our cat May, Piper is able to jimmy open the laundry room door. Naughty girl! Bobby says: Make sure all your black cats are put away safely! For my family, it is crucial that we make sure our black cats, Henry, Bobby and PHolly, are away in the basement with the others. It would be really hard to see a black cat dart out the front door at nighttime, just as it would be hard for them to see a car going down the street. 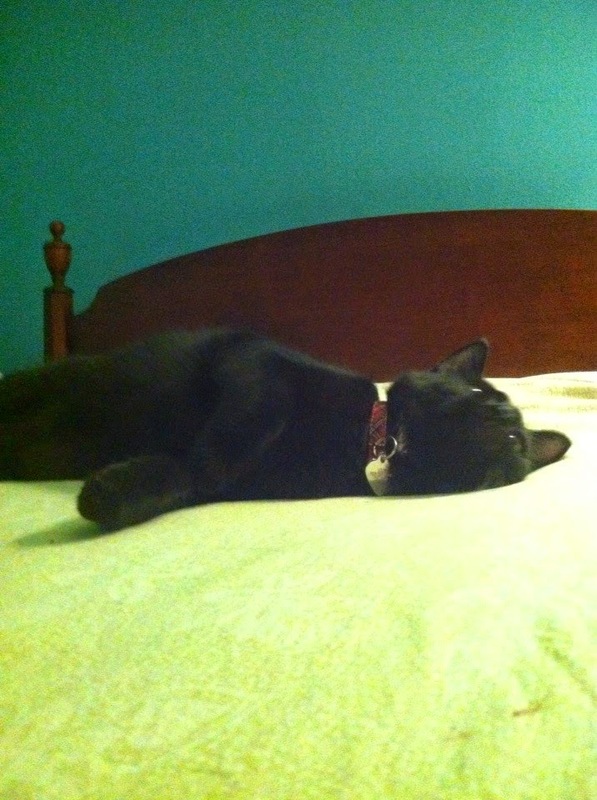 Black cats have a connotation of bad luck, especially when one crosses your path. If we believed this myth, we wouldn't have three black cats. 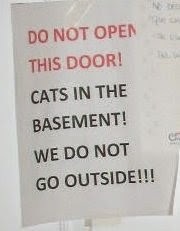 It is extremely important that all cats, especially black cats, are firmly planted far away from the front door. Halloween brings a lot of strange noises and strange people, and even the calmest cat can become frightened and disoriented if they get out. Just in case, make sure she has a collar and ID tag on at all times. Halloween’s rough for pets. They can’t trick-or-treat, they can’t throw parties, and their costume selection is seriously lacking. To fight The Man Pic Monkey has partnered with fellow Seattle startup Rover.com—a nationwide network of dog lovers that connects pet owners with local, loving dog sitters—to put together a spectacular Halloween contest. It’s called #FrankenPet and you could be one of the winners. How’s all this work?Simply don your photogenic pet in a costume (or not, it’s optional) snap a photo, and jazz ‘em up with our Halloween features. Once your masterpiece is complete, share it. As long as you use #FrankenPet, we’ll see it on our Twitter, Facebook*, Pinterest, Instagram, Google+, and Flickr. You gotta share by 11:59pm on Halloween, and the winners will be announced on the 5th of November (remember remember). Who wins?Three winners. Three runner-ups. One for each category: Creepy Canines, Scaredy Cats, and Other Beasts (birds, lizards, monkeys, you name it). We’re looking for creatures with the most creative photos. Scare us, delight us, or make us say d’aawwwww! Wait a minute! Where’s your obligatory legal stuff?Contest Submission Agreement: By submitting to the #FrankenPet contest, you give PicMonkey and Rover permission to reuse your photos in future branded content and promotions. Neither Rover nor PicMonkey employees are eligible to win. Everyone is welcome to participate, but due to legal mumbo jumbo, prize eligibility is limited to the United States. *If you’re posting to Facebook, your privacy settings will affect whether or not we can find your image. If your profile is set so only your friends can see your photos, we definitely won’t be able to find it. So you can either post your photo directly to our Facebook page, choose one of the other social media options to share your photo, or change your privacy settings for the duration of the contest (if you’re so inclined). And visit Rover.com to find a dog sitter. You can use code "sandpiper20" to receive $20 off a dog sitting service. I was not compensated for this review, though I will receive a free month of Royale services for sharing the contest. Coupon code void where prohibited. I love incorporating cat themed items into my life, especially when they are too cute for words. That is the Shu Uemura Shupette Collection designed by Karl Lagerfeld. Just in time for the 2014 holidays! Karl Lagerfeld is a German fashion designer. He works currently as the head designer and creative director for the fashion house of Chanel, as well as Fendi and his own label. Shu Uemura is a Japanese make-up artist and the founder of Shu Uemura cometics. Uemura died in 2007 but his legacy lives on in his beautiful products. "An exclusive makeup collection from the world's most famous furry beauty, Choupette Lagerfeld. Continuing a family affair, Mr. Uemura and Karl Lagerfeld were friends for more than 20 years - the world's most fashionable feline mademoiselle Shupette is ready to dip her paws into haute de gamme beauty creation for the 2014 holiday collection. 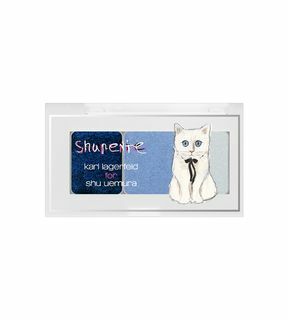 'Shupette by Karl Lagerfeld for Shu Uemura.'" -shu uemura website. What is not to love from this collection? Everything from the packaging to the products are absolutely beautiful. My favorite item from the collection is the "shupette has-it-all eye & lip palette" which retails for $89. 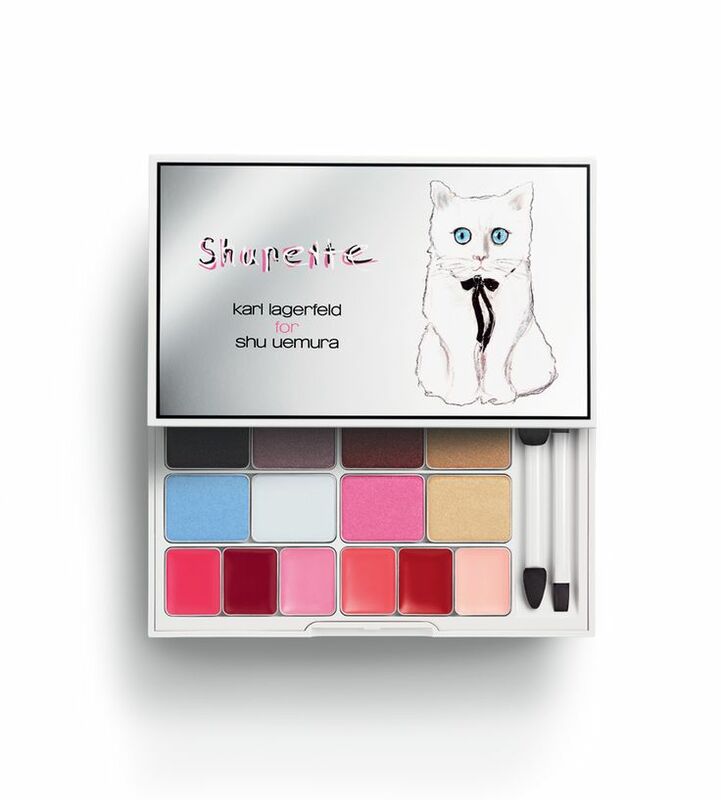 I love the sleek look of the palette, especially Shupette's bright blue eyes and black bow. He reminds me of my Pearl. If you interested in seeing swatches of the Shupette collection, visit xSparkage - Leesha - a YouTuber and blogger, click here. Leesha has a coupon "SHUXSPARK" where you can receive a free Shupette tote and free shipping. Personally, this was my item of choice -- the eye-need-shu trio 01, $35. The eye need shu trio 01. Retails $35. Let me know what you think of the collection and if you'll pick anything up! Let’s face it – when you share your home with pets, smells are unavoidable. And if you’re like my family and have seven (wonderful, albeit occasionally smelly) cats, it can sometimes be hard to control the odors. In steps a revolutionary change in air purification: the CritterZone Air Naturalizer. The CritterZone is a godsend for our household. We have a wall unit that plugs in to an outlet and begins working its magic on any odors lingering in the area. Launched in 2013 by Bill Converse, the CritterZone works to clean the air the same way that nature does through sunlight, wind and even thunderstorms. The process is natural, which means it doesn't need a filter or perfume cartridges - because those only make the air quality worse for our pets. The CritterZone has many great qualities including the fact that it doesn't need a filter! No need for expensive replacements! The CritterZone is small which makes it portable. This ease of movability is great if for some reason a stinky spot pops up in a different room than where CritterZone is plugged in to the wall. The CritterZone is designed to neutralize odors from pets. So unlike a quick burst of Febreze that will fade almost instantly, the CritterZone is constantly working to clear the air of odors. 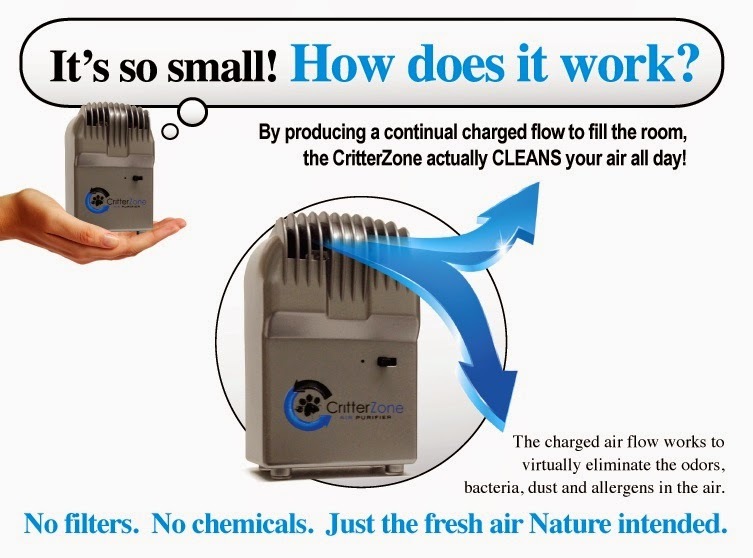 The CritterZone can work to clean the air in an 800 square foot area, making it ideal for apartments and large rooms. The CritterZone is cost effective as it costs less than a penny per day to run. This makes it affordable to use to clean your air 24/7. 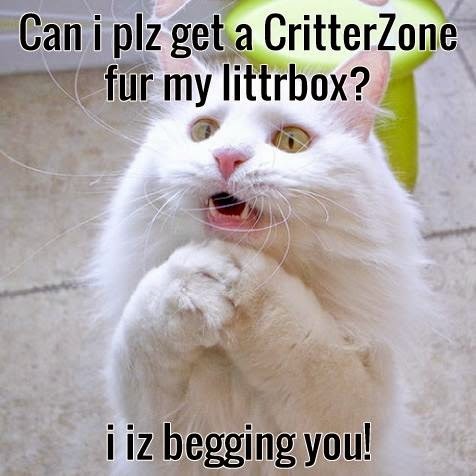 Think of the CritterZone as a $99 investment. Purchase your wall unit here and use the code sandpiper for $10 off your purchase - making the CritterZone a wonderful investment at $89. And since we love the way the CritterZone works in our household, we wanted to give you a chance to win a CritterZone wall unit! Enter below via the Rafflecopter widget. Giveaway to run from 12 am EST 10/20/2014 to 10/27/2014 at 12 am EST. The CritterZone featured in the pictures was purchased with my own money. I may be paid a small fee for units purchased with the coupon code. All reviews are my own opinion and are not influenced by this company or fees paid. 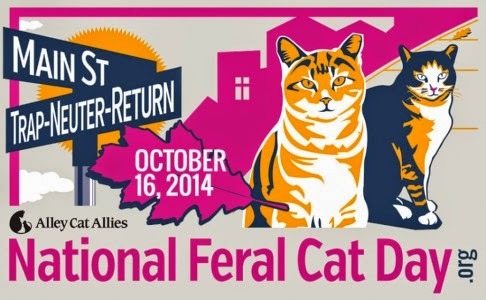 National Feral Cat Day 2014. 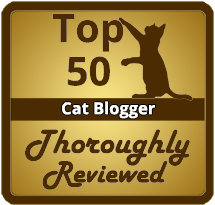 Welcome to Sandpiper Cat Blog and Happy National Feral Cat Day 2014! At SCB, we have been celebrating National Feral Cat Day for four years now! We celebrate in order to raise awareness for feral (community) cats that live in our world. This year, the National Feral Cat Day theme is TNR: From The Alley....To Main Street, brought to us by Alley Cat Allies. National Feral Cat Day launched in 2001, on the 10th anniversary of Alley Cat Allies. The goal of the day is to promote TNR (Trap-Neuter-Return) programs. Watch the video below to learn the difference between feral and stray cats. Community cats have existed alongside people for 10,000 years. They are called community cats, feral cats or outdoor cats. Most community cats are not socialized to people, they are not adoptable. Community cats (as members of the domestic cat species (like pet cats) are protected under state anti-cruelty laws. Community cats should not be taken to pounds/shelters. Community cats can live full, healthy lives outdoors - but are usually killed in shelters. Their kittens can be adopted into homes, but they must be socialized at an early age. Alley Cat Allies is a wonderful organization, that was founded in 1990 and its headquarters are located Bethesda, Maryland. 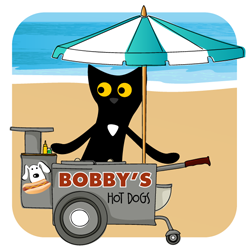 Alley Cat Allies is the only national organization dedicated to the protection of cats. Please share our post today, or any day you come across it and help raise awareness about community cats. Read our past posts from 2011, 2012 and 2013. Information courtesy of Alley Cat Allies. Used with permission. 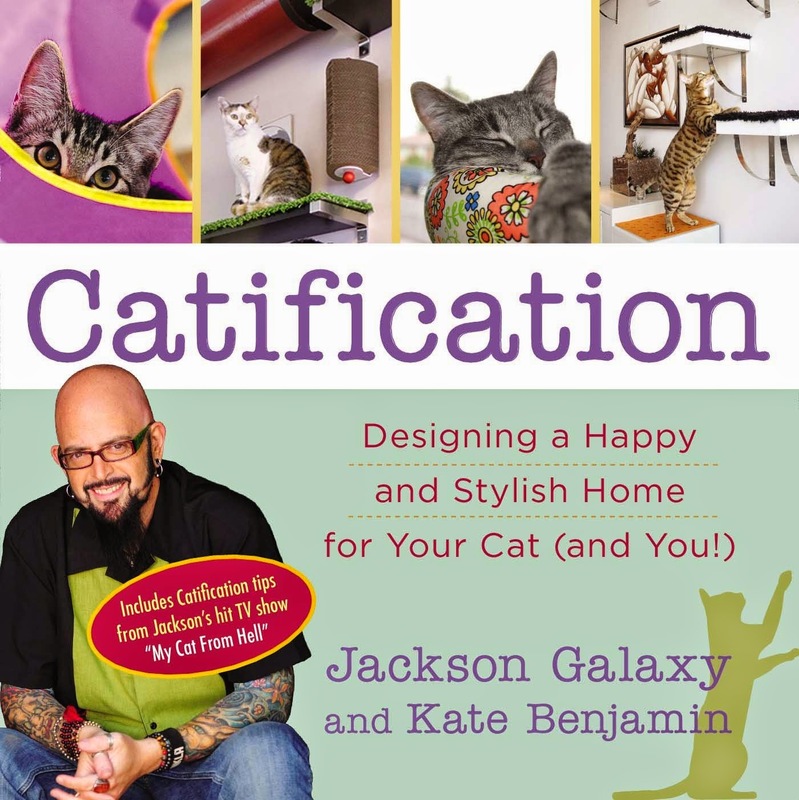 Sandpiper Cat Blog is so excited for the release of Jackson Galaxy and Kate Benjamin's new book, Catification: Designing a Happy and Stylish Home for Your Cat (and You!). Especially because we have one copy to giveaway! Details below. This book is fantastic as it is filled with colorful pages and 15 do-it-yourself projects for cat lovers who want to create their own cat towers, kitty hammocks and much more. Catification is purrfect for the cat lover in your life, you and even new cat parents. If this book isn't on your coffee table or bookshelf, you need it in your life ASAP. 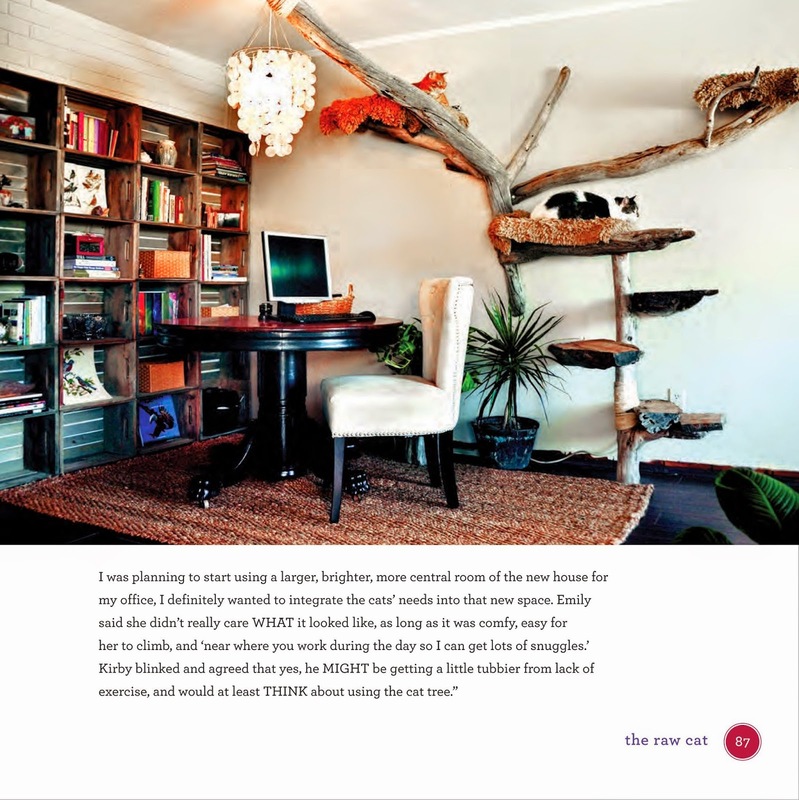 Get creative ideas on how to build a kitty super highway in your own house. Help your cats live stylishly and comfortably. Jackson Galaxy is a Cat Behaviorist and currently hosts Animal Planet's My Cat From Hell on Saturday, 8 pm EST. 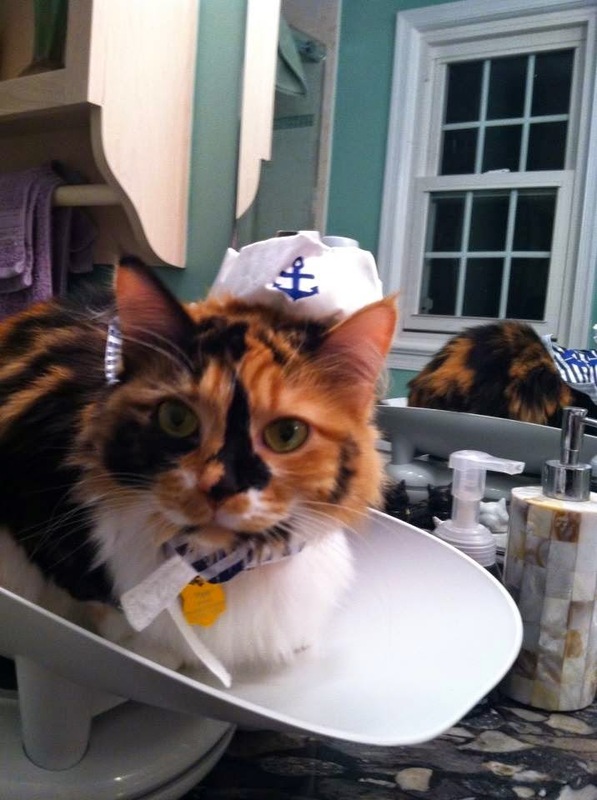 Kate Benjamin writes Hauspanther, a premier online magazine for design-conscious cat people. Purchase a copy of Catification on Amazon, Barnes & Noble or Indiebound. 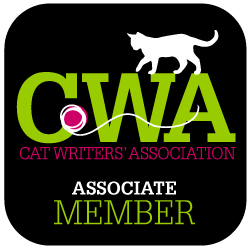 And for our lucky readers, I am able to offer one of you the chance to win a copy of Catification. Enter below through the Rafflecopter widget. Enter through the Rafflecopter giveaway below (comment entries not accepted). Email Sandpipercatblog@gmail.com with any problems. Giveaway to run from 12 am EST 10/14/2014 to 10/21/2014 at 12 am EST. Receiving a complimentary copy of the book did not influence this review or anything we stated. I was not compensated for this review. All opinions are honest and my own.